Phahonyothin (Thai: พหลโยธิน) is centred around Phahonyothin Road, a major arterial road that starts at Victory Monument and runs parallel to and eventually merges with Viphavadi Rangsit Road in the north of Bangkok. Also spelled Phaholyothin, Pahol Yothin, and many other variations, it stretches northward all the way past the old Don Muang Airport towards Rangsit, Ayutthaya, and (if you drive long enough) Chiang Rai. There are few sights that are actually worth it to come all the way up here for, but most tourists make a beeline for the Chatuchak Weekend Market. Originally, Phahonyothin Road was named Prachathipatai Road (ถนนประชาธิปไตย) and was 22 kilometres long from Victory Monument to Don Muang Airport. Field Marshal Plaek Phibunsonhkhram extended the road north to Sing Buri, and renamed it Phahonyothin Road in honor of General Phraya Pholphayuhasena, the second Prime Minister of Thailand (commonly known as Phot Phahonyothin). Later it was extended further, all the way to the Burmese border for a length of 1,005 kilometres. Phahonyothin is a vast district stretching 30 kilometres from north to south. This article only covers that part of Phahonyothin Road that is actually within the Bangkok Metropolitan Administration. Until 2006, nearly all air travellers to Thailand landed at Don Muang Airport. Don Muang has been an important airline hub, and for a long time held the title of second busiest airport in Asia by passenger volume. The first commercial flights to Don Muang Airport started in 1924; since then it has been a commercial airport for the whole district, attracting many hotels and businesses. Because of this commercial activity, Bangkok mostly expanded northwards and Phahonyothin turned into one of the most developed suburbs of Bangkok. Many of Bangkok's residents live here and commute downtown every day. Getting from the fringes to the southern part of Phahonyothin might take two hours or more, depending on traffic. While the northern part is barely visited by foreign visitors, the southern part has some major highlights. 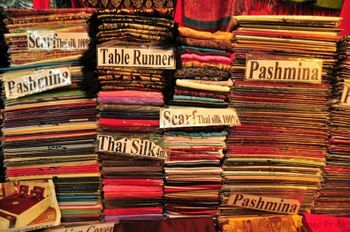 Shopping is the main activity here; a visitor hasn't been to Bangkok without visiting the huge Chatuchak Weekend Market, the largest market in Southeast Asia with over 8,000 stalls. And while still off the beaten track to foreigners, Soi Ari has turned into a hip artist-y neighbourhood with plenty of cheap and not-so-cheap dining options. With the opening of Suvarnabhumi Airport in 2006, Don Muang Airport closed completely for one year. After a big renovation, it was reopened in 2007 for non-connecting domestic flights, but still few airlines make use of it. The economic engine that Don Muang used to be suddenly stopped working. Local five-star hotels turned into two-star hotels and airport-related businesses moved out of the far north. Luckily, 30 kilometres south, commercial activity is still alive and kicking. Phahonyothin is a major arterial road, and as many Bangkokians that live here work downtown, there are plenty of ways to get to the area. The Skytrain is an excellent way to get to and around Phahonyothin. The BTS Sukhumvit Line runs over Phahonyothin Road, with the most important areas of the district covered. The line comes directly from Siam Square and Sukhumvit. If you're coming from Silom, you transfer from the Silom Line onto the Sukhumvit Line at Siam BTS station. The line passes Sanam Pao, Ari and Saphan Khwai stations, before reaching its final destination at Mo Chit, which is nearby the Chatuchak Weekend Market and the Northern Bus Terminal. At Mo Chit, the Skytrain intersects with MRT metro system Chatuchak Park, so you can easily continue your way from there to Ratchadaphisek. The metro only covers a small part of Phahonyothin, but it goes further than the Skytrain. If you need to go to the far north, take the metro to Phahon Yothin MRT station and then continue your way by metered taxi or bus. The metro is also a convenient way of getting to the Chatuchak Weekend Market. MRT station Kamphaeng Phet drops you right in front of the main entrance of Chatuchak Market. 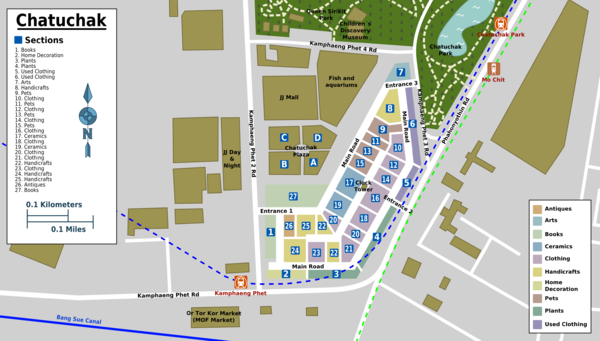 Chatuchak Park MRT station also gets you there, but you will have to walk to the eastern entrance. The metro terminates at Bang Sue, an important train station that can be used if you're taking the train in northern or northeastern direction. The Phahonyothin area stretches as far north as 30 kilometres, and the BTS and MRT systems don't go that far. So you'll have to travel as the locals do - by bus. Going by taxi is also possible, but that costs more. Keep in mind that bus travel in Phahonyothin can take time. Getting from north to south can take you two hours or more, depending on traffic. The most important line is the ordinary and air-conditioned bus number 59 which runs 24 hours a day. It starts at Sanam Luang in Rattanakosin and passes by Ratchdamnoen Klang Road (for Khao San Road) and Panfa Leelard pier, the western terminus of the Saen Saep Express Boat. It then continues through Lan Luang Road, Phetchaburi Road, and heads north along Phaya Thai Road, passing Victory Monument. From there, it goes all the way north along Phahonyothin Road passing the Chatuchak Weekend Market, Don Muang Airport and finally the Thammasat University campus in Rangsit. Going by metered taxi is the most comfortable (and expensive) way to get in and around the district. It can be used for both short and long distances. Always insist on the meter. If the driver refuses, get out and get another taxi, as there is always another one waiting for you. A ride from Sukhumvit or Silom to Chatuchak Weekend Market shouldn't cost you more than 100 baht. If you're heading up north to Don Muang Airport, expect a price in the 200-300 baht range, depending on traffic. Bang Sue Train Station is a worthy alternative for the busy and crowded Hualamphong Train Station, but can only be used if you're heading to the north or northeast of the country. You can reach it using the MRT metro system, of which Bang Sue is the last stop. You can also take the Skytrain to Mo Chit and continue by metered taxi. Northern Bangkok's biggest draw is the Chatuchak Weekend Market (จตุจักร, also "Jatujak" or even "JJ", Sa-Su 09:00-18:00, +66 2 272-4441), an incredibly vast, 35-acre indoor and outdoor market that has more than 8,000 vendors selling anything and everything under the sun. To put that number in perspective, if you browsed every stall one minute each, non-stop for eight hours on every Saturday and Sunday, it would take you around two months to visit them all! A good rule of thumb is to buy immediately if you spot something interesting, as you will never find that same stall again. After World War II, the market was established around Sanam Luang in Rattanakosin and was moved to the north of Bangkok in 1978. Now it has 200,000 visitors a day who together spend around 30 million baht! Chatuchak has a fairly good mix of local residents and foreign tourists. It started out as a market for bargains, but over the years has also become a haven for specialist shops that charge a little more. Getting there is easy - go to Mo Chit station by Skytrain or get off at Kamphaeng Phet station by metro (Chatuchak Park MRT station is also an option, but Kamphaeng Phet station drops you off at the southwestern most interesting part of the market). The market is open on Saturdays and Sundays, and opens at 09:00, so get there early to beat the crowds and the heat. The market officially closes at 18:00, but slowly becomes less interesting after 16:00. Keep an eye on your belongings here as pickpockets work in the crowds, and avoid Chatuchak on rainy days as the roofs and drains here aren't quite up to a tropical downpour. You can imagine that orientation here is a world of it its own; the only recognisable landmark is the Clock Tower in the middle of the complex, so you might want to meet there in case you get lost. In theory, the market is divided into 26 numbered sections depending on types of goods sold, but in practice you'll quickly get lost in its maze of 69 sois and dozens of other roads. Maps are available and for an extra detailed map of Chatuchak you can buy Nancy Chandler's Map of Bangkok at Teak House Art in section 2 to help you better navigate around the area. The pets section has lots of puppies and bunnies on sale, but is particularly controversial as many of these shops are a front for the trade of protected (and even endangered) animals under the counter. Most of these animals are smuggled in from other countries, and Chatuchak serves as a hub for private animal collectors and others interested in exotic hornbills, snakes, turtles, etc. These practices are not as visible as they used to be following a number of crackdowns. A single crackdown in 2003 found 5,000 illegal exotic animals on sale at the market, though often only the deal is negotiated here with the handover done elsewhere. If you don't want to see crocodiles on sale in small cages or see live cockfights take place, you might want to skip the pets section. 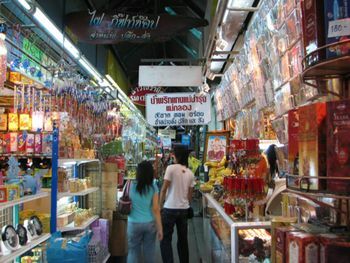 Chatuchak is a very good place for buying all kinds of traditional Thai handicrafts, silk and antiques. A lot of these stores are congregated in the southwestern part with prices which are much lower than in Silom. Haggling is expected for some small items. Antique shopping is fun, but pretty much all on sale are fakes, as genuine antiques require a permit to be taken out of the country. The area around section 27 is good for daily necessities. There are toilets, a smoking area, several ATMs and you can change money there. Food stalls abound along the western, southern and eastern side of the main road. Expect the usual Thai dishes such as pad thai and Isaan food, however mainly as 'tourist' prices. Northern Bangkok's hippest place to eat is the area around Phahonyothin Soi 7, better known as Soi Ari (or Aree). More restaurants can be found in the nearby Rama VI Soi 30, which is also known as Soi Ari Samphan. Many musicians and artists migrated into this neighbourhood and the bars and restaurants cater to this audience. Just off Ari BTS station, these busy streets are divided into their own sois, with Ari Soi 1 featuring a bustling market packed with food stalls and the trendier/more expensive joints around Soi 2 and 3. There are many street food vendors at Phahonyothin Soi 7 (Soi Ari). Just off the BTS and around the corner on Soi Ari are a multitude of street stalls selling some of Bangkok's best street food, from Chinese-style wonton noodles, Isaan specialities such as som tam, larb, gai yaang, as well as pad thai, Thai desserts and stands that can whip up basically the entire repetoire of Thai cuisine, all for around 20-30 baht per dish. Several bars aimed at young Thai socialisers have sprung up at the Or Tor Kor farmer's market area, near Chatuchak. A stone's throw from the Kamphaeng Phet MRT station (exit 1) are at least 20 small pubs, bars and restaurants that operate every day of the week. There are many accommodation options within a fifteen minute drive off the old Don Muang airport. Getting online in Phahonyothin is not as easy as in other districts. Luckily, there is a free Wi-Fi hotspot available near S&P at the ground floor of the Shinawatra Tower III (1011 Viphavadi Rangsit Rd, at Phahon Yothin MRT station). Just follow Phahonyothin Road to the north as the concrete jungle continues in Rangsit. It has huge shopping malls and a hypermodern temple complex. 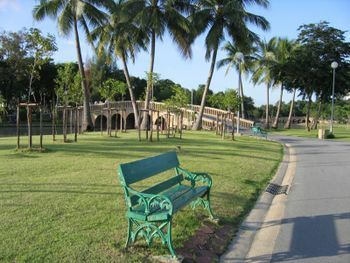 Phahonyothin is already a pretty exotic part of Bangkok, but if you want a more serene experience, try Ko Kret. In the weekdays, when Chatuchak Weekend Market is closed, more cheap shopping is to be had in Pratunam. This page was last edited on 14 November 2017, at 04:13.